I am walking down the stairs into our basement, where my stereo lives, when my brain alerts me that something must be attended to, that something living demands my attention. No burglar awaits; not even my dogs need my company. Instead, my stereo plays an LP that was pressed in 1959, Keely Smith's, I Wish You Were Here. I have been fooled by the LP. It would be impossible for her to be singing in my basement, as Ms. Smith died last year. My perceptual mistake was brief, probably less than a second, but it served to remind me why I am willing to put up with the hassle of playing LPs. Tidal offers this album, but I have never been fooled by Tidal. Virtual reality, it seems, was a reality, at least a partial reality, back in 1959—an amazing accomplishment. No, I am not saying that LPs are perfect—far from it—only that good LP playback can strip away familiarity and force us to acknowledge its existence. Many times before I have speculated that the ticks and pops of LP playback might prompt our brains to treat the music as belonging to the real world, not the canned, dead world. Recently, I was given a plant by fellow who was moving away. I thanked him and asked how often I should water it. He answered that I didn't need to water it, as it was fake. It couldn't be, I thought, as I saw the imperfections of real plants, brown leaves, bug bites, a broken stem—all fake, and such a subtle deception. I know that money counterfeiters throw their fake money in clothes dryers with poker chips and tumble dry, which lends a much-used quality to the paper; we imagine that fresh, crisp bills are much more worthy of close inspection, as the old bills have already passed their many inspections. My other theory that explains why LP playback is special is that since the LP playback involves rubbing a rock on spinning plastic and suspending the cartridge with a mechanical tonearm, things will give rise to vibrations, which will harmonically enrich the resulting sound in natural way, as most musical instruments are vibrating mechanical devices. In other words, LP playback adheres to natural colorings; it belongs to nature. Another feature I have noticed is that LPs invite a social dimension, as spinning LPs for friends is an unhurried and enjoyable event. Perhaps having to perform the LP ritual—the finding of the LP, which can be as elaborate and time consuming as an archaeological dig, its cleaning, applying a few anti-static Zerostat shots, handing your friends the LP jacket, cleaning the needle, adhering the record clamp, spinning up the LP to speed, lowering the needle carefully—make its playing more of a small gift, as it did require some effort. In contrast, playing music from a computer-based server or CD playback is more like handing a buddy a can of beer, rather than painstakingly mixing up a decent fancy drink, such as a Ramos fizz. Now, I will walk it back a bit. Sometimes we want elevator music, something that fills the silence and can't grab our attention. LP playback doesn't fill this need. In fact, as I write this, I have returned to Tidal, as I can set Tidal to autopilot and mostly ignore it. Another good feature, this time a more positive feature, is Tidal's or a computer-based music server's ability to play random orderings of your music. I have read that cats enjoy seeing the world on their backs, as the upside-down view is freshly different. I feel this way when I hear an album played back in a random ordering of tracks. I remember driving my car and listening to my music played back in a random fashion. I heard a song that I never heard before and which I was certain that I didn't own. At a red light, I looked at the selection. I did own it; I had heard it many times before, as I had played the entire album many times. Yet, only that time did the song register. It would have remained mentally buried and forgotten had I not indulged in jumbled playback. In short, LPs are here to stay and I am glad about it. When teenagers see my stereo, the first thing that draws their attention is the turntable and the shelves of LPs; the second thing is the glow from the tubes. Fancy cables mean less than nothing to them and loudspeakers are far less interesting than headphones to them. I have replaced the old PH-1 with the new PH-2. Like the new Rev E. Aikido PCBs, the PH-2 uses only polypropylene power-supply reservoir capacitors in its four power-supply RC filters. In addition, each channel's heater power supply connections are separate. And the new PCB is half an inch shorter (10.5 inches long). 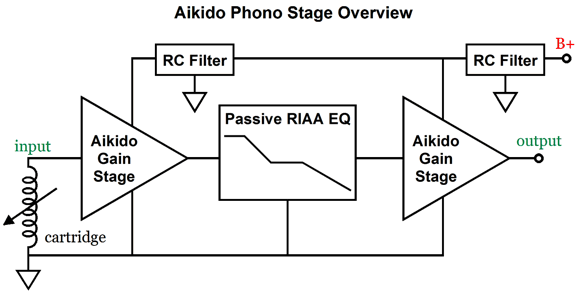 Although the circuit remains the same, two Aikido gain stages with passive RIAA equalization in between, I felt that the new boards were different enough from the PH-1 to warrant a new name, PH-2. Note the four large 50µF/550V polypropylene capacitors in the rectangular boxes. Each Aikido gain stage gets one. Also note how the tubes now sit at the outside of the PCB, rather than at its center, as they did in the PH-1. So, do the new changes result in a sonic change? I believe so. The first thing I noticed was a wider stereo image, so much so that I might have to move my speakers closer together. In fact, I had to play a few mono LPs to make sure everything was wired up correctly, as I am hearing more separation between channels than I have ever heard before many of my most beloved albums, such as Miles Davis' classic, Kind of Blue. As I have listened to this album two times a year for the last 40 years, I don't expect any surprises, yet I was surprised. I wish that I had tried separate heater configurations long ago, say 40 years ago. The power supply used is the PS-21 and I used two 50VA toroids to power it. What is missing is a metal divider plate to place between the PCB and the transformers. Ideally, it would be made of soft steel, but aluminum is what I can readily buy. I find that they make a big difference in keeping power-supply noises away from the high-gain circuitry. Additionally, the transformers should be located at the front of the enclosure, not the rear. The right switch is one of my Stereo-Mono switches; the middle switch, a Select-Freq switch; and the left switch, a Select-AC switch. The enclosure is from Par-Metal in New Jersey. Here is the schematic for just one of the two channels. The tube line up is 12AX7 followed by 12AT7, passive equalization, then 12AX7 followed by 12AT7. In spite of my famous preference for maximal options, this is what 99% of users will use. (I do plan on trying a 12AY7/6072 or a 5751 in the first input tube position.) The gain comes in at a bit over 40dB. With my high-output Dynavector 10X5 high-output moving coil cartridge I have to turn the volume way down. The GlassWare PH-2 phono stage kit includes all that is needed to populate, including the capacitors (28), including four CDE 1kV polypropylene coupling caps and hand-matched RIAA equalization capacitors, PCB, resistors, standoff assemblies with O-rings and screws (9), and ceramic tube sockets (8), except for the tubes; sets of eight high-quality tubes, however, will also available once I refuel my supplies. The Kit includes a 16-page user guide. The GlassWare PH-2 phono stage kit is available now at the GlassWare-Yahoo store. My preference is for feedback-free gain stages and passive gain stages, as it produces the sound that I like best. But forgoing negative feedback puts more demands on us, as the topology must be intrinsically conducive to clean amplification, the tubes must be on spec and matched between channels, and we must be willing to accept some drift with aging tubes. In contrast, feedback gives us lower measured distortion and lower output impedance and far greater consistency in spite of off part values and aging tubes. The crazy analogy that I have made is between pastry wrapped dishes being able to get away with less fresh ingredients, as the yummy, butter-rich pastry will hide a large deficiency in delicacy within. Well, I was wondering what was the least number of triodes I could get away with using in a negative-feedback-based gain stage. Two seemed to be the only answer. We would need two triodes so the phase didn't reversed and so that the in-phase signal could be fed back to the inverting input on the first stage, completing the feedback loop. The above a simple two-stage gain stage that uses a negative-feedback loop. But then I remembered the anode-follower or plate follower, which uses only one triode. If we resistor R2 bigger in value than R1, we can set the gain to some value beyond unity gain, until we reach the limit set by the open-loop gain of the grounded-cathode amplifier stage. My next thought was that I could replace the plate resistor with a constant-current source, which would no doubt be made from solid-state devices. This then got me thinking about using these solid-state devices in a different configuration, so greater gain could be realized. The single 6DJ8 triode is cascoded by the NPN transistor, so its plate is shielded from the power-supply noise. The PNP transistor sees the varying voltage drop across the 100-ohm collector resistor and the PNP transistor both amplifies and inverts this signal at its collector, which in turn drives the negative feedback loop. I decided to model this circuit in SPICE and see how well it did with 1mV of signal at 1kHz. Not bad at all. Note that the 3rd harmonic is lower than the 2nd and 4th. The PSRR came in at better than -32dB and the output impedance was about 300 ohms. I then wondered is adding a cathode follower would improve the performance. The cathode follower's cathode resistor is the negative-feedback resistor. 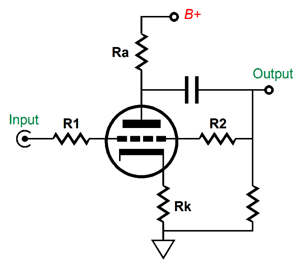 The PNP transistor's collector resistor is now much larger in value, so more open-loop gain can be realized. I wondered what this would do to the harmonic structure. 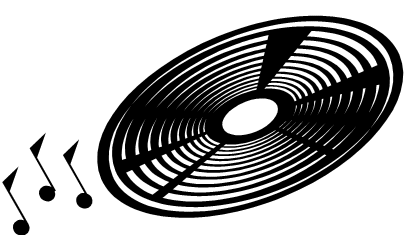 Well, after fiddling with part values, I got these results. No, this doesn't look anything like the usual Fourier graph. Not like a push-pull or a single-ended amplifier harmonic signature. This array of harmonics is the rarest of rare: odd harmonics are lower than even harmonics. No piece of audio gear that you have owned or ever heard displayed such a harmonic structure—a very safe bet this would be. Out of the thousands and thousands of Fourier graphs I have seen, I have only seen this arrangement a few times. Super interesting. One 6DJ8 tube per channel; one coupling capacitor at the output. The 6DJ8 triode on the right is configured in what I call a retrograde cascode. (See post 344 for more details.) The MJE350 PNP transistor located at the 6DJ8's cathode sees no AC signal at its base other than a small injection of power-supply noise, which produces some Aikido mojo by enhancing the PSRR. The 47k base resistor drops a bit over 2 volts due to the base current. The result is that the 6DJ8's grid sees a much lower voltage than its cathode sees. The 21.6k resistor might cause some distress, as they are not made; but 43.2k resistors are made and two in parallel equal 21.6k. Note that the second stage employs no negative feedback. In the SPICE simulations, the frequency response was within 0.004dB from 20Hz to 20kHz. 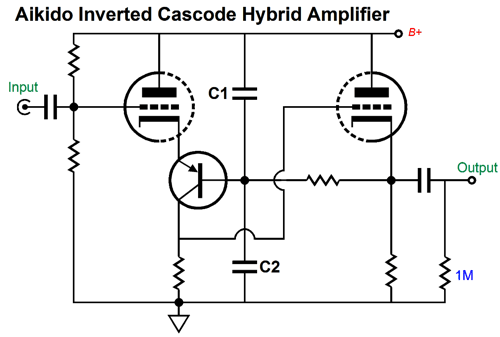 By selecting the right values for capacitors C1 & C2 we can dramatically improve the PSRR of this cascode circuit. Plugging this circuit into a complete phono preamp is easy enough. Once again, only one coupling capacitor and no negative feedback on the second stage. In SPICE simulations, the frequency response was nicely flat, with a slight +0.028dB bump at 30Hz. Distortion comes in at about 0.1% at 1Vpk at 1kHz. Not bad at all. This design offers some good features, such as only two tubes per channel, high gain, low output impedance (about 100 ohms), low distortion. I didn't add great PSRR to the list as we run into the problem of capacitor tolerances. The 100µF capacitor used in the second stage will probably be a 20% electrolytic capacitor, but we need 1% tolerance capacitors to achieve a deep noise null. Couldn't we just buy 10 capacitors and measure them? We could but an electrolytic capacitor should be formed first. Capacitor forming is a subject few audiophiles know about. To "form" a high-voltage electrolytic capacitor requires a high-voltage power supply. We can place a big-valued resistor, say 1M, in series with the capacitor and the power supply outputs. Then we measure the voltage drop across the capacitor. If the electrolytic capacitor is a few years old and never been used, it can take quite a few minutes to come up to the full voltage, as the complex chemical reactions within the electrolytic capacitor take place, as the capacitor "reforms." Another way to form an electrolytic capacitor is to place a 1k resistor in series with it and the power supply and monitor the current flow as you slowly turn up the DC voltage. As soon as the meter jumps up, back down on the DC voltage. This method is the quickest, but it requires the most effort from you. After the capacitor has been reformed, place a 100k resistor across it to discharge it—and leave the resistor there for much longer than you think it requires, as electrolytic capacitor can rebuild a voltage after being shorted, which is why high-voltage electrolytic capacitors are sometimes shipped with their leads shorted into aluminum foil. Okay, let's return to the problem of exact capacitor values. After we have formed the high-voltage electrolytic capacitors, we have to measure them. I own two capacitance meters and they deliver different results with electrolytic capacitors. Why? Maybe due to different test frequencies or due to the way ESR is or isn't factored in the calculation. One workaround might be to use non-polarized electrolytic capacitors, which might offer tighter tolerances due to their being used in speaker crossovers. Lyrics don't always count. Long ago, a friend lent me a CD of a female singer he had enjoyed. I gave it a listen and when I returned his CD I said, "Wow, that was a bit harsh. But thanks, anyway." Didn't you like her voice?" "It liked her voice, but her words were a bit too much." "What do you mean, words?" "Well, for example, I never thought someone could sing an upbeat song about the necessity of universal and compulsory castration." "What? Did she really sing about that?" "You did listen to the lyrics, right?" "What do you listen to instead?" "I treat voices as if they are musical instruments and I pay no attention to the words. That is why I like opera so much, but I never know what is being said. Besides, aren't all songs about either being in love or suffering from a broken heart?" In general, he was right, which explains why paying attention to the a song's lyrics is so often optional. The days of the Great American Songbook are long past. As Wikipedia puts it: "Despite the relatively narrow range of topics and moods dealt with in many of the songs, the best Great American Songbook lyricists specialized in witty, urbane lyrics with teasingly unexpected rhymes." Today, Rappers talk about their wealth and women—and thier cars; if you do not know what a "Cut Dog" or "Lambo" or "Rari" is, count yourself lucky. Country singers tell stories about love or bad luck. Today's Pop singers can seldom complete an entire sentence, let alone express witty or complex thoughts; indeed, many seem to suffer from some form of dysphasia, as even the utterance of a single complete word escapes them. Don't know what I am referring to, then listen to a pop radio station for an hour or two; it s a pe culiar ex pe rience. At the other extreme, two Canadian singers, Joni Mitchell and Leonard Cohen, are known primarily for their lyrics. "But at the end of the day, it's Abbuehl's ability to express the beauty or bittersweet of a lyric with the slightest turn of phrase that makes Compass so rewarding. It takes a good singer to get to the core of a song; it takes a great one to do it so in a way that puts the song first and ego second. Dark, mysterious and sensual in the most insidious of ways, the appeal of Compass is its breadth of emotion, beautifully delivered without a trace of excess." Tidal has four albums by her and all are worth listening to; The Gift is available in MQA. And three of the CDs are from ECM, so you can be assured an audiophile-grade experience. I just gave the fourth album, Princess, a listen to make sure that it too deserved a recommendation. Indeed, yes. Really exceptional. If you have been reading my posts, you know that my lifetime goal is reaching post number one thousand. I have 576 more to go. My second goal is to gather 1,000 patrons. I have 932 patrons to go. Help me get there.